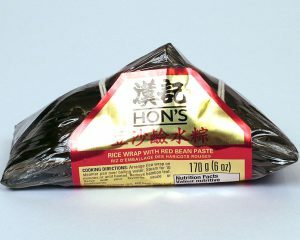 Bring an exotic Asian treat home with Hon’s Rice Wraps! Stuffed with sticky rice and a variety of savoury fillings, our Rice Wraps follow traditional recipes for a truly authentic and delicious flavour. Steam or boil and serve with your favourite sauce. 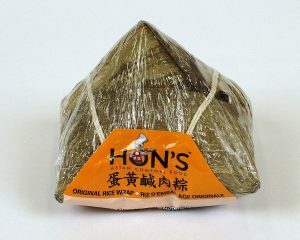 Green mung beans, pork and egg yolk with rice, seasoned and wrapped in a bamboo leaf. Heat and serve. Cooking directions: Arrange rice wrap on steamer pan over boiling water. Steam for 10 minutes or until heated. Remove bamboo leaf; serve with your favourite sauce / condiments. Red mung beans, pork and egg yolk with rice, seasoned and wrapped in a bamboo leaf. Heat and serve. Cooking directions: Arrange rice wrap on steamer pan over boiling water. Steam for 10 minutes or until heated. Remove bamboo leaf; serve with your favourite sauce / condiments. 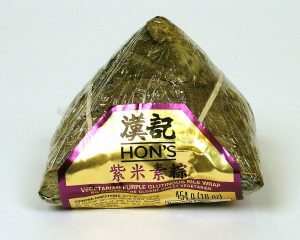 This deluxe wrap is made with black rice, bamboo shoots, mushrooms, chestnuts, mung beans and chewy seitan. A unique treat – heat and serve. Cooking directions: Arrange rice wrap on steamer pan over boiling water. Steam for 10 minutes or until heated. Remove bamboo leaf. Serve with your favourite sauce or condiments. 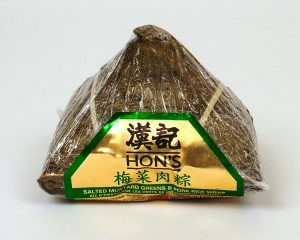 Seasoned, shredded pork and salted mustard greens are mixed with sticky rice and wrapped in a bamboo leaf. Heat and serve. 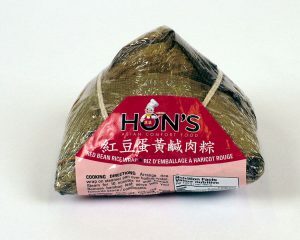 Cooking directions: Arrange rice wrap on steamer pan over boiling water. Steam for 10 minutes or until heated. Remove bamboo leaf. Serve with your favourite sauce or condiments. 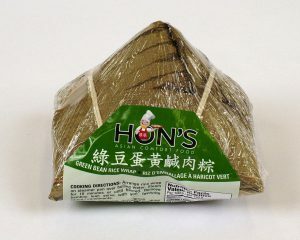 An Asian class – blended red beans and rice wrapped in a bamboo leaf. Heat and serve. Cooking directions: Arrange rice wrap on steamer pan over boiling water. Steam for 10 minutes or until heated. Remove bamboo leaf. Serve with your favourite sauce or condiments.